This weekend Mike Stewart's "2017 Three Castles Award Winning" RPG Victorious has a bundle on sale at RPGNow / DriveThruRPG. You get over 60 bucks worth of Victorious releases (including the core game) for 20 bucks. You really can't go wrong. 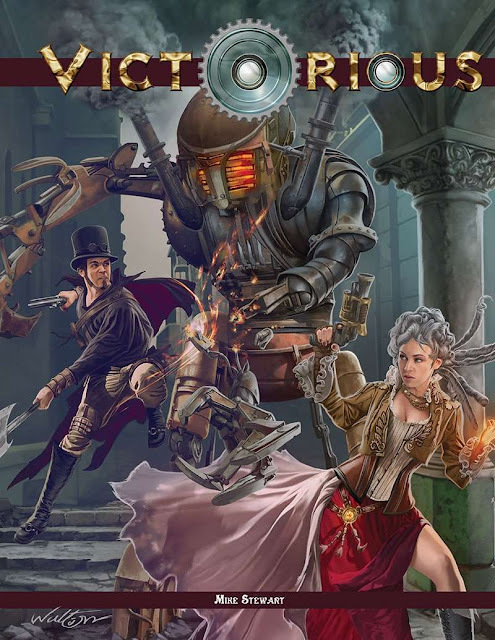 I played in a session of Mike's Victorious at NTRPG 2015 and it was a blast! The rules are built off of Castles & Crusades and should feel familiar to any that play OSR games. Hey all--it's Gen Con this weekend! We're not there, and if you're not either (or even if you are, we aren't bitter) then here's a little sale on Victorious product to hopefully help you feel a little better about it. Save over 60% on The Victorious Bundle! The core rulebook, introductory adventure A Night For Jackals and four supplements--Rule Britannia, Manifest Destiny, Phantasmagoria, and the Hunter & Hunter Catalogue. Now through Sunday you can get this bundle, normally over $60 -- yours for $19.99! Purchases made via The Tavern's affiliate links go to support The Tavern and its various projects. That includes the Hero's Brew podcast. We just recorded the first episode last night and hope to release it this weekend.